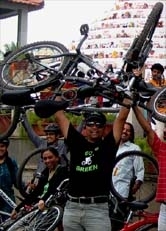 Go Green Campaign Ride on 07 Feb 2010 - GGI-Group size: 4000+ Professionals, Increasing on day to day basis, Come & join us 2 serve Mother Nature. 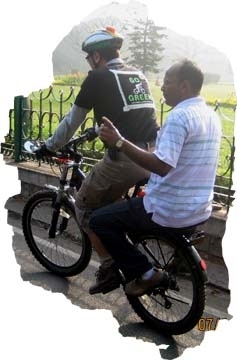 We were 22 GGI's for this Campaign Ride starting from RIC junction (Jaynagar 5th Block) met @ our usual CubbonPark Central library. Following was the route followed . Started @ 7:00am and were able to be @ cubbon park central library by 7:30am where our other GGI's from other parts were waiting. Cubbon park - UB-City Gate - Malya Hospital - Richmond road flyover - double road - Lalbagh Main Gate - Lalbagh Rear Gate - Mahadevan Park - 4th Block - KFC - Raghavendra Matth - RIC junction. 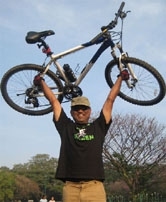 we had Mr. Sanjeev who had already sold out his motor bike and was ready to buy a decent Cycle but much before that he wanted to meet us and test ride few cycles to decide on the best. 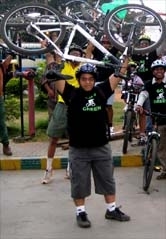 Few Snap shots during our Campaign Ride..